EasyCare's $10,000 Hoof Boot Contest is in full swing! Riders have logged an incredible 17,247 miles and counting! Click here to see the current results. Terri Tinkham and horse Oliver Twist continue to stay in the number 1 slot but the numbers continue to change as time goes on. It's exciting to see what the final results will actually be. It's not too late to log some miles yourself. So get out and ride! EasyCare's $10,000 Hoof Boot Contest! EasyCare's 2008 $10,000 Hoof Boot Contest is coming to a close. We had an excellent turn out this year and are already working on some exciting changes for the 2009 contest! To date riders have logged 16,279 miles in EasyCare Hoof Boots. And there is still a few rides left! 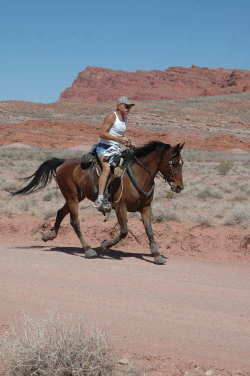 Teri Tinkham and her horse Oliver Twist have logged an incredible 1,770 miles and are in first place. Way to go Teri! Below are the top ten contenders for 2008. Check out our results page to see a full list of the current standings. Changes and updates for 2009 will include bonus miles and bonus cash. Riders are eligible for bonus cash after completion of 300 miles (482 km), after 300 miles (482 km) riders will be paid $1.00 per mile in 100 mile increments. When a rider reaches 400 mile or 643km in the contest they will receive $100.00 cash, at 500 miles or 804 km riders will receive an additional $100.00 cash, etc. There is no limit to the bonus cash. EasyCare will give riders the opportunity to earn bonus miles during the ride season. Bonus mileage will be given to complete events in new EasyCare hoof boot designs and to compete at certain events in EasyCare hoof boots. Final 2009 contest details will be posted soon. 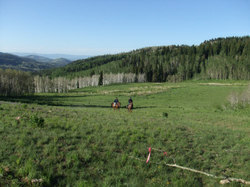 Click here to check out some of the great photos taken at last weekend's Color Country Endurance Ride in Hurricane, Utah. This ride brought us to a total of 5,170 miles logged so far in the 2008 Hoof Boot Contest and it's only the middle of April! It's not too late to enter the contest yourself! Click here to check out the contest standings and find out how you can enter this years contest. Be sure to take the time to join in on the fun! EasyCare's 2007 Hoof Boot Contest has come to an end. We are proud to announce the top ten winners of this exciting contest. 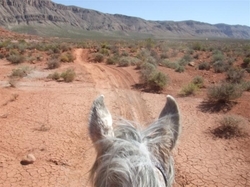 In 2007 we had 81 riders complete more than 19,000 miles using Easyboots on barefoot horses! 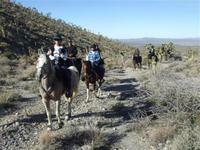 These riders have been competing successfully on bare-booted endurance horses in ride distances of 50 miles and up. Every distance ride has been completed by these riders, from single day 50’s, 75’s, 100’s, and up to five day 250 mile multiday rides. Check out Karen's blog to read more about this years contest and also read what first place winner Dave Rabe has to say about his placing. Congratulations to all of this years riders! Enter today for your chance to win your share of prizes and awards! In 2008 the hoof boot contest is open to ALL horses using EasyCare hoof boots riding ALL distances! That means barefoot or shod, 25 miles and up! Check out our updated contest rules and entry form so you can join in too!!! Happy riding!!! Last month we had a blog contest to see who could tell us what changes were made to the rules for the 2008 Hoof Boot Contest. Those who answered the questions correctly were entered in a drawing to win a free pair of Easyboots! Congratulations to Karen Bumgarner!!! 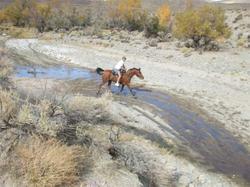 She knew that the 2008 contest now includes shod and barefoot horses as well as distances of 25 miles and up! Click here to learn more about the 2008 Hoof Boot Contest! Forms for the 2008 contest can be downloaded here. Tags: 2008 Hoof Boot Contest, Blog Contest, Easyboots, EasyCare, Inc. Win a Pair of Easyboots! Last week EasyCare started a new blog contest. All you have to do is answer two questions correctly and you will be entered in a drawing to win a pair of Easyboots! So far we haven't received too many correct answers. Hint... the answers are in our blogs. Interested in entering the contest? Click here to learn more. Be sure to pay a visit to our other blogs and email us your answers. Have fun and good luck! Enter to Win a Free Pair of Easyboots!!! 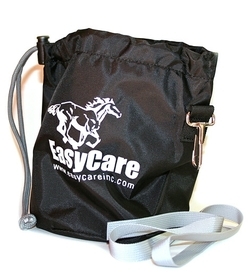 EasyCare recently released information on the 2008 Hoof Boot Contest. A couple of the rules have been changed compared to the 2007 Hoof Boot Contest. Do you know what TWO changes were made to the rules? Simply email us your answers. The entrants with the correct answers will be entered in a drawing at the end of the month for a free pair of Easyboots! Limit of one entry per email address. EasyCare Summer Video Contest Winners! We received a lot of great video entries for EasyCare's first Summer Video Contest. Thank you to everyone who submitted a video. And now... the moment you have been waiting for!!! The winners have been selected, so click here to see the official results! Congratulations to all the winners!!!! Visit the EasyCare Video Weblog to view all the contest entries. EasyCare, Inc. and the Equine Sciences Academy are pleased to announce that EasyCare will be offering a total of eight first-term scholarships in the amount of $1,000 to the Equine Sciences Academy. Four scholarships will be awarded to the Fall 2007 class, and four to the Spring 2008 class. Each scholarship has a $1,000 value and will be applied toward first term tuition. EasyCare will reimburse the student for the scholarship amount once they have successfully completed their first year studies. Applicants must first apply to and be accepted into the Academy. Once accepted, students may apply to EasyCare. Recipients of the first-term scholarships may also reapply for a second scholarship in the spring. In the event that a student receives a second scholarship, the award would be applied to the second term tuition. As the field of natural hoof care continues to grow, so will the demand for qualified professionals. EasyCare is excited to be able to assist those looking to make natural hoof care a career. We are currently working on expanding this new scholarship program to include additional programs and organizations that educate and train qualified applicants in the natural care of horse’s hooves. For more information and application requirements, please contact the Equine Sciences Academy at: http://www.equinesciencesacademy.com. The purpose of the Equine Sciences Academy is to educate students in all key aspects of the care and custody of domesticated equines based on the study of the life of the wild horse. A university format includes comprehensive studies on all required coursework, practical instruction, rigorous testing, and practical exams. The goal of the Equine Sciences Academy is to be the most comprehensive and professional training program in natural horse and hoof care available. The program will basically follow a distance learning university format, with the exception of required practicums. The program is designed as a two year course, but actual completion time may vary based on a number of factors including, but not limited to, scheduling, ability to pass all required elements before progressing, prior experience etc. We just received this cool entry for EasyCare's Summer Video Contest. Check it out. Don't forget... the contest will be running through the summer so be sure to grab your camera and submit your own video. 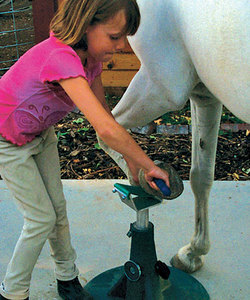 There's still time to send us your helpful tips about EasyCare hoofboots. So email us, and keep those tips coming in and you will be entered in a drawing to win the cool new EasyCare Gloves. We will be drawing the winners for EasyCare's Useful Tips contest on Monday. 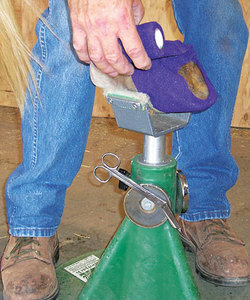 The $10,000 EasyCare Hoof Boot Contest continues to gain momentum. To date we have over 12,000 miles completed and 64 riders have completed endurance rides with EasyCare Hoof Boots. Lynda Thompson and her son Ryan are shown below at the Strawberry Fields Forever. Both Ryan and Lynda have 100 Hoof Boot Contest miles. Do you have a helpful tip about EasyCare hoofboots that you'd like to share? Just email us your tips and your name will be entered in a drawing to win the new EasyCare Gloves. 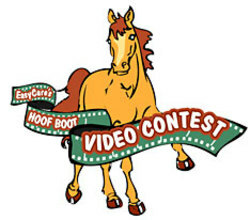 The EasyCare Hoof Boot Video Contest has begun! Get those creative juices flowing and warm up that video camera! You'll have the opportunity to submit your own "booting tips or commercials" to EasyCare via YouTube.com™ that depicts or illustrates how to use EasyCare Hoof Boots, or showing EasyCare Hoof Boots in action. The contest will be running through the summer and ends on August 31, 2007. Click here for a complete list of contest rules and here to see the list of fabulous prizes that will be awarded! We've even added an EasyCare Video Blog! That way you can follow the contest and check out the videos entered if you'd like:) You'll also be able to view them on youtube.com. Have fun! And ACTION!!!! EasyCare Gloves and HoofJack's Now Available! EasyCare Gloves have been added to our online store! 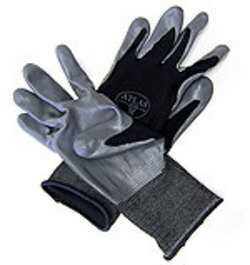 These gloves are great to use while working with horses hooves and boots. Actually, they're great for any kind of chores around the barn or house. HoofJack's have also recently been added to the online store. They are very cool and a must have for any horse owner! Just your luck... there's still time to get in on the special promotion. During the month of May you will receive a $25 account credit good toward your next EasyCare purchase when you buy a HoofJack. Now that's a great deal! So stop by our online store and check these newly added products out. You'll be glad you did! Get Your Video Cameras Ready! If you haven't signed up to receive the EasyCare Newsletter now is certainly the time to do it. Starting June 1st we will have a fun new contest you will not want to miss out on! Complete details will sent out in the June 1st newsletter. Click here to subscribe. The contest will involve videos, and youtube.com. Click here (or below) to check out this video made by Bernie Harberts and his mule Polly called "Haulin Oats." It's not made for the contest, but it is a great example of Easyboots in use. Stay tuned to this blog or the newsletter for more information on how you can make a video and win some really cool prizes! 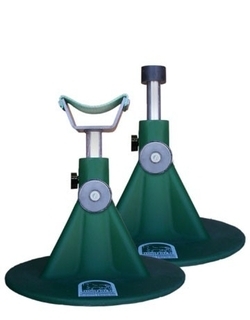 Receive a $25 account credit when you purchase a Hoofjack during the month of May. Hoofjacks are very cool and a must have for any horse owner. This is a great addition to our online store. Check it out! Subscribe to our newsletter to stay updated with our latest contests and promotions! The EasyCare $10,000 Hoof Boot Contest continues to grow in popularity. The 2007 contest currently has over 110 riders and is still growing. To date the riders have completed more than 5,000 miles in hoof boots. Here is a link to check the status of the contest. Dave Rabe and Karen Chaton are currently leading the contest with Dave at 610 miles and Karen is at 565 miles. 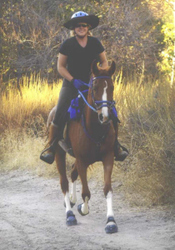 Lauren Horn is leading with the most miles on a single horse. She has ridden Red Hot Rosa 430 miles, and just finished the 75 miler at Git'r Done. Karen's horse Granite Chief has done 415 miles this season. Dave Rabe has competed in the contest the last three years and consistently rides 2,000 miles of AERC events each year. Dave has 38,440 lifetime AERC miles! Wow! It's an honor to have a rider like Dave Rabe racing each weekend in EasyCare hoof boots. 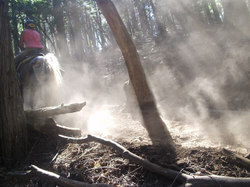 The photo below is Dave riding Lightning at the Color Country multiday ride. Dave completed all three days in Easyboot Epics. Tags: $10, 000 Hoof Boot Contest, EasyCare, Hoof Boots. 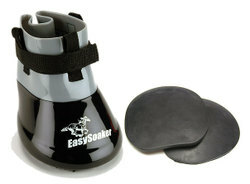 EasyCare will be including a FREE pair of Dome Comfort Pads with each pair of EasySoaker boots purchased. The pads will automatically be included in your purchase while supplies last. 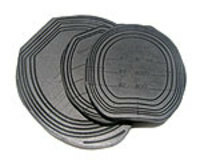 These pads are still in the testing phase and are not available for retail sale. We have received a lot of great feed back from users. If you like the results you get from using them, consider our regular EasyCare Comfort Pads. Click here to read more about this great promotion. Hoofjacks make working on your horses hooves a bit easier. As you can see it is helpful to even the smallest of horse enthusiasts. Do you want a Hoofjack of your own? 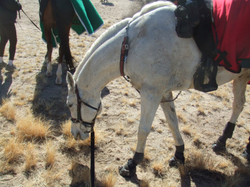 Check out our April newsletter to learn how to enter our Hoofjack contest. Not a subscriber to our Newsletter? No problem! Just click here to subscribe. Get your FREE Get a Grip T-shirt! 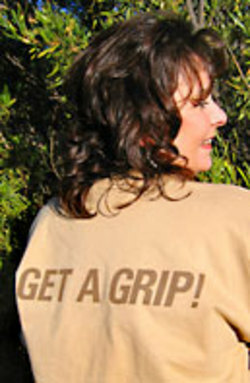 The first 75 website orders will receive a FREE Get a Grip T-shirt. Don't miss out on this stylin shirt. Please be sure to note your shirt size on your order. The 2007 EasyCare $10,000 Hoof Boot Contest Continues to grow. We now have 86 riders signed up to compete on barefoot/booted horses. Keep checking back, we may reach 100. 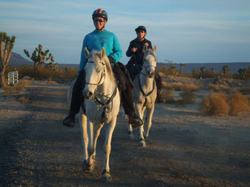 We had 14 riders start the first day of the three day Mojave ride. In addition to the 14 riders in the contest, there were several riders using Easyboots over iron shoes that were not entered in the contest. A couple photos from the event are below. The grey horse is Karen's horse Rocky. Rocky went over the 7,500 mile mark at this ride, and has always used Easyboots! The other rider is Kathy Backus, DVM, finishing. The two riders finishing are Becky Hackworth and Sue Benson (2nd and 3rd in the 2006 Hoof Boot Contest). A New Contest Is In The Works! We’re working on a cool contest for the spring and early summer. Make sure to subscribe to our Newsletter, as the details will soon be in there. Click here to subscribe. More details to come. EasyCare has a new promotion! During the month of February you can receive FREE US ground shipping on website orders over $150. We are always adding new promotions so check back often to see what’s new. Click here to visit our Contest and Promotions page.